A brilliant, life-affirming, and hilarious memoir from a "genius" (The New York Times) and master storyteller. With illustrations by Jason Polan. 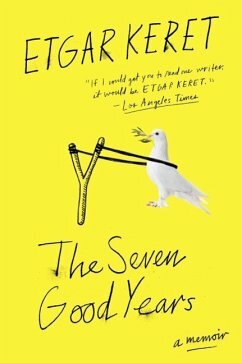 The seven years between the birth of Etgar Keret's son and the death of his father were good years, though still full of reasons to worry. Lev is born in the midst of a terrorist attack. Etgar's father gets cancer. The threat of constant war looms over their home and permeates daily life. What emerges from this dark reality is a series of sublimely absurd ruminations on everything from Etgar's three-year-old son's impending military service to the terrorist mind-set behind Angry Birds. There's Lev's insistence that he is a cat, releasing him from any human responsibilities or rules. Etgar's siblings, all very different people who have chosen radically divergent paths in life, come together after his father's shivah to experience the grief and love that tie a family together forever. This wise, witty memoir-Etgar's first nonfiction book published in America, and told in his inimitable style-is full of wonder and life and love, poignant insights, and irrepressible humor. From the Hardcover edition. Etgar Keret, geb. 1967 in Tel Aviv, ist der bedeutendste Schriftsteller Israels seiner Generation. Er schreibt Kurzgeschichten, Graphic Novels und Drehbücher. Sein erster Film 'Jellyfish' wurde 2007 auf den Filmfestspielen in Cannes als bestes Debüt ausgezeichnet. Keret lebt mit seiner Frau und seinem Sohn in Tel Aviv.